Earlier this month, we asked MyCarNeedsA.com customers on social media to vote on what factors are involved in their decision to get their car serviced. How long is the decision process? How often is it considered? What would persuade them to take the car into the garage? The results point to a dependence on car’s warning lights, with the high majority of people reporting that only the car’s in-built service warning light would convince them to consider taking their car in for a checkup. As you can see, 64% of the people polled reported that the warning light would be their source of concern, whereas comparatively less people would take heed of any unusual noises or their mileage since last service, the latter having long been quoted as the industry recommended gauge of when to get your car serviced. 18% of people quoted their own Peace of Mind as the primary reason, which indicates that roughly 1 in every 5 people service their car to remain steadfast that it is performing optimally and as safely as it possibly can. However, it’s clear the standout statistic remains the skewed majority who only consider a service when informed by their car’s warning lights, which have illuminated our dashboards for some time now. This selection of lights each indicate a different issue with our cars’ health. Taking a step further forward from that, many modern cars can allow you to examine specifically which areas of your car are in need of a service, with either specific warning lights or a list of system checks in the car’s in-built computer touchscreen. However, relying entirely on warning lights when planning for your service brings with it a series of issues which, if ignored, can lead to problems. The first and foremost is that not every car possesses every warning light. Some newer models actually forego traditional warning lights in favour of displayed warnings on in-built touchscreens. As for older models, traditional warning lights can differ in colour, design and potency from car to car. When it comes to safety, many of the warning lights installed in car dashboards are red or critical warning lights. These lights will indicate that a car’s oil levels are dangerously low, or that the Anti-Lock Braking System has failed. It’s advised that if you ever see any of these, that you stop driving and get your car serviced immediately - for the safety of yourself and your car. However, you may not always be in position to do this. If you’re on a long journey in a remote area of the country or even abroad, stopping immediately and getting a service is easier said than done, either forcing you to risk driving in a faulty car (never advised!) or calling out on breakdown cover and insurance - which not everybody has. Simply put, it’s better to take more consistent care of your car and keep it in good health to the point where these red lights will never need to illuminate. When it comes to performance, warning lights are never going to account for the optimal performance of your car, as they’re safety lights. A poorly performing engine, for example, as a result of engine oil with residue or mixed in dust and grime that’s broke through an unchanged engine filter, is not going to be warned to you with a dashboard light. This can and will cause poor fuel consumption economy and by proxy a harder strain on your clutch and brakes. Therein the last problem is money. Whether it’s a hefty repair bill, or more money paid weekly on fuel due to a greater quantity of petrol needed to power an engine which is poorly performing, it’s all money that’s going to come out of pocket which otherwise wouldn’t be needed. Warning lights are a last resort. They’re there to warn you that something either is or is about to be critically wrong. Your car is a vital tool and a reliable friend to you. 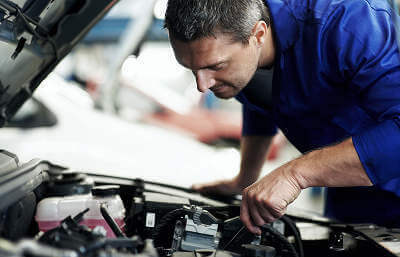 It deserves a good degree of care and it’s recommended that a car receives either a half service every 6 months or 6,000 miles or a full service every 12 months or 12,000 miles. With this, you’ll be sure in your mind that your car is as safe as it needs to be and is running as smoothly as it can do. If you do decide to invest in a service now or anytime in the near or distant future, you can go ringing around loads of garages or spend over an hour trawling across all their websites - or you can submit the work to us and we’ll network it out into all our local garages in your area, who’ll then return to you with their quotes. All you’d have to do would be submit the job and then choose the right quote for you - whether that’s the cheapest, best by location or by extra benefits, ensuring the most convenient service for you and by the most trustworthy garages, as voted by MyCarNeedsA customers. You can submit work to us here and we’ll do the rest, as our network of garages will bid for your work. To find out more about how our service works, have a glance at our helpful guide here.